I feel... wow. I feel triumphant. I feel oxygenated. I feel hyper-alert. I feel more than a little tired. We made it! 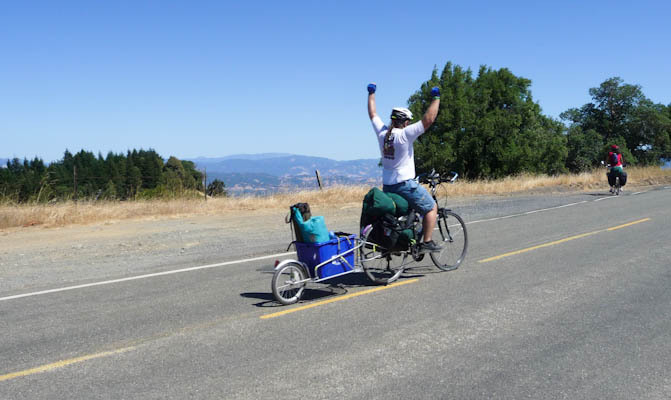 Eric and I bicycled a circuit of over 110 miles of very hilly terrain, over three days, while carrying camping gear with us. And Eric, the real hero of all this, did it while pulling a trailer of gear, with a twisted ankle. He is amazing. 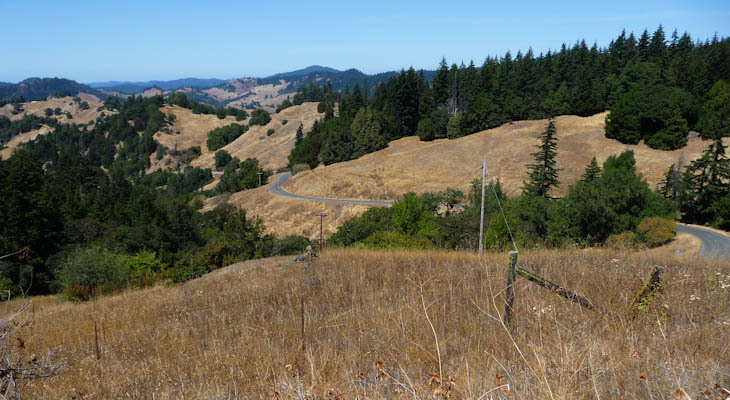 We saw mile after mile of spectacular Mendocino County scenery. We also climbed mile after mile of miserably steep hill. Someone at the last campsite asked us, "Why do you do this?" and we had to say it was really for the glory at the end, knowing not only that we could do it, but that we did do it. And of course it's a much more intimate way to see the countryside than through a dirty car window. 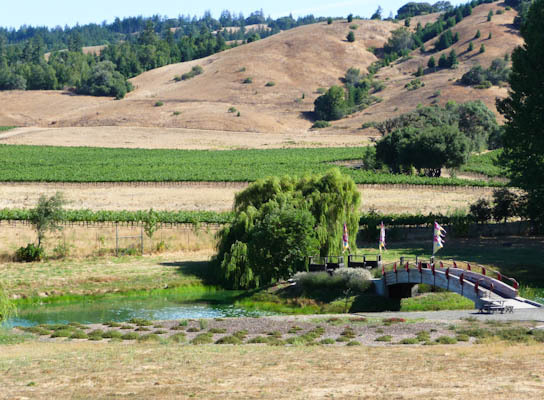 The tour was called, "Baths, Barns and Booze," named for the hot springs the night of the second day, the farm country along the way, and the many wineries and breweries on the road. 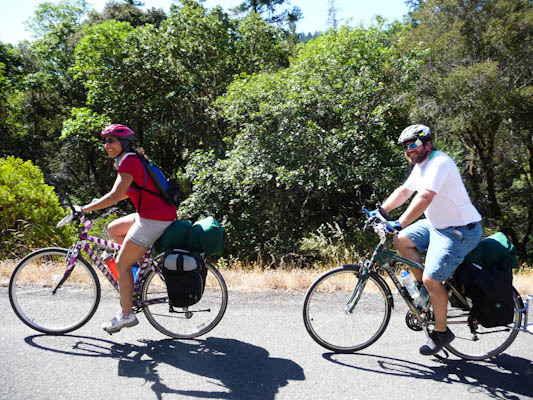 The route takes you through central, not coastal, Mendocino County. Mendocino County is known for beautiful redwood trees, loggers doing their best to consume them as quickly as possible, and stoned hippies doing their best to get in the way of loggers. 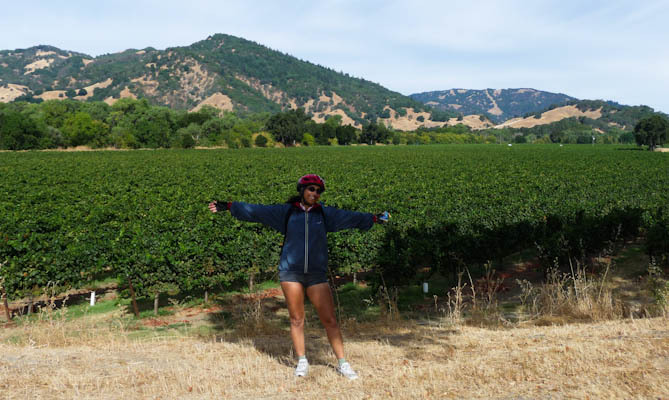 I found the tour last September in a Lonely Planet book called, Cycling the U.S. West Coast, and I thought a three-day bike trip sounded like a lot of fun. I didn't originally plan it as a camping trip, but I couldn't find any place other than campsites that would let us pay for only one night on a weekend. The tour was rated "moderate" by Lonely Planet, but I'd be willing to bet that carrying camping gear on a moderate tour would push it into at least the "somewhat hard" category. We had expected to deal with high temperatures as well, but we were blessed with lovely, reasonably comfortable weather all weekend. Sheherezade and Boing, with the load we carried, and the trailer Eric mightily pulled. Eric and I spent months riding our bikes together training for this tour. I wanted to emphasize distance in our training; Eric wanted to emphasize hills. 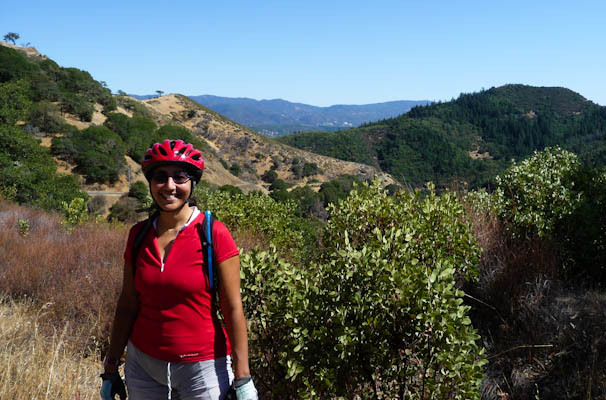 We did both, riding as far as 40 miles in a day, and climbing up and down the East Bay hills, with SCUBA weights in our bags (to simulate the weight of the camping gear). I'm quite glad now that Eric made us train on hills, because I read the guidebook almost a year ago, and didn't remember, until Eric re-read it to me in the car on the way up, that at least the last day of the trip would be extremely hilly. I had thought we were training for a relatively flat route. What a surprise. It's not that I hadn't done extensive terrain analysis; it's just that I used resolutions between 1.25" = 1 mile and 1.25" = 2000 feet for the topo maps, and it just wasn't high enough. The maximum resolution on those lovely Google terrain maps is 1.25" = 1000 feet, which is somewhat more descriptive, but we didn't want to carry quite that large a wad of paper maps. We would have been better off paying real money for a larger topo map of the entire area, but if we'd looked closely at one of those, we probably would have decided not to do the trip! We didn't actually train for pulling the camping gear more than three miles up a 10% grade, but somehow we in fact did it. This trip was made possible by three things: (1) ibuprofen, and lots of it; (2) the Shimano Mega-Range Cassette, which Eric has on his bike and which has gear ratios lower than 1:1; and (3) Dave of Dave's Bike Shop in Ukiah, and especially his girlfriend Ginny, who rode up the 10% grade with us. Without their encouragement, I don't know how we would have made it. At lunchtime on the Tuesday before we were due to start the trip, Eric sent me a text message saying that he had twisted his ankle. We were devastated. After all of our preparation, we might not be able to make the trip after all. He came home on crutches, and spent Wednesday in bed recuperating. I began to make alternate plans. We had made some nonrefundable deposits on campsites, and of course we had planned on a long weekend of sightseeing. I told Eric that if he couldn't ride, we could still take the trip by car, find the geocaches we had planned to find along the route, and see the scenery. Thursday morning he told me he felt he could go to work, and Thursday night he told me he really wanted to try to do the trip on the bikes. So Thursday night we packed up Pearl both with cycling gear we hoped to use and other gear to use as a fallback if necessary. The weekend started off well with CalTrans closing the Bay Bridge on Friday. The shining Golden Gate may attract all the photographers and tourists, but inglorious Bay Bridge carries a far heavier load of the Bay Area's incessant traffic. Anticipating BART trains packed like the Tokyo subway, I dragged myself out of bed half an hour early to ride back the wrong way on the train to get a seat. I trotted onto an entirely empty car at the train's first stop, and lost sleep I truly needed for nothing. I had also hoped to leave work early, but sat there at my desk until 5:00, mumbling to Eric on the phone, "Help, I'm trapped in an office tower!" We did make what turned out to be one very good decision: for Eric to take Pearl, entirely packed up and loaded, to his current temporary work site north of our home, for me to take the train to its northernmost station, and then for both of us to leave together from there. Not going home probably saved us at least an hour, and we needed that hour! We drove from Richmond to Ukiah in traffic that wasn't actually all that bad for a holiday weekend. We settled into a Motel 6 room that was rather crowded with two bicycles, a trailer, and all of our other gear. The wonderful Motel 6 people were kind enough to agree to custodiate Pearl for three days while we propelled ourselves around without her internal combustion assistance. Where to park your car is a huge issue in bike touring. We rose at 5:30, with the intention of leaving at 6:30, as soon as there was enough light enough to ride. The ideal Lonely Planet plan was to spend the night in Boonville, about 45 miles away, then ride another 45 to Orr Hot Springs the next day. Since no one in Boonville would rent to us for just one night, we needed to get all the way to Hendy Woods State Park, about 55 miles away, on Saturday. At our typical geocaching/photographing/birding pace of about six miles per hour, I figured we'd need all the daylight we could get. Of course it was 7:30 before Eric did a test ride around the parking lot. He decided he was feeling well enough to try the ride. We made elaborate backup plans for me to leave Eric with the gear and ride either backward or forward along the route and come back and retrieve him with Pearl if necessary. Worst case scenario, we would find a phone and call the Better World Club, which offers bicycle roadside assistance. We started out on Eastside Road, paralleling US 101. This spot was nice, flat, shady and virtually free of automobile traffic. We made our way along, having fun and finding caches. We stopped in Hopland (pop. 2231) for a ridiculously early lunch. This collection of restaurants and shops along Highway 101 was a thriving metropolis compared to the towns we would visit on Sunday. We were tempted by a sit-down lunch, but, afraid we would run out of time before dark, opted for the faster Subway. The Subway had outdoor seating, allowing us to carefully supervise our overloaded bikes. We continued on Mountain House Road, which climbed from about 500 feet to about 1200. We thought that was steep. Only now do we belatedly realize that Saturday was our easy day. Most of the distance we accomplished on Saturday was on Highway 128, known for traffic and a general lack of shoulders in most places. I had been apprehensive about it, but once we were riding it, it didn't seem terribly bad. I guess after riding so many miles on Oakland streets, we were just used to riding in traffic. 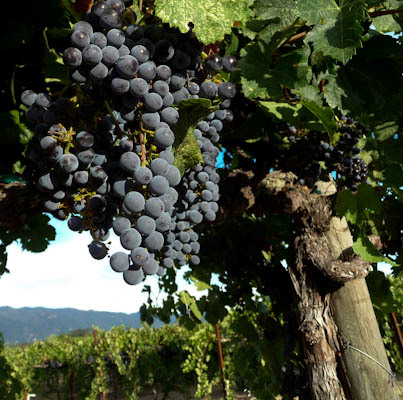 Highway 128 had one winery after another. It's almost too bad we don't drink wine. There were also a couple of breweries, but I wanted to be sober for the ride. The wineries featured expansive scenery. Eric in front of a winery. Some of the wineries had grapes hanging right by the side of the road. We couldn't resist the temptation to sample some grapes. They weren't really sweet enough to eat. We arrived in Boonville, Home of the Two-Night Minimum, around 4:00. It seemed terribly early for dinner, but after so much time in the saddle, we just wanted to sit down and have someone bring us food, rather than cooking on a gas burner in a campsite. We rode up and down looking at restaurant choices, and settled on a Mexican place named Alicia's. Alicia's had a lovely outdoor patio with picnic umbrellas where we could eat while watching the bikes. The food was good and reasonably priced. 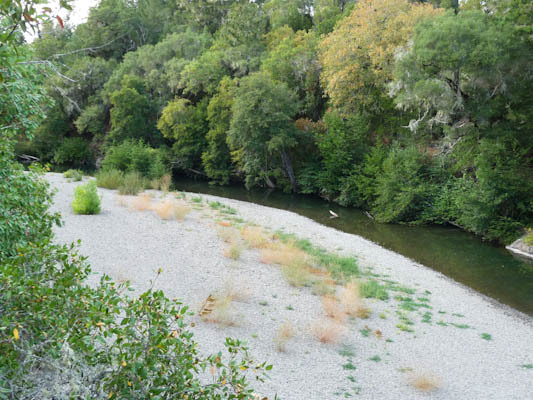 Another hour or so of riding and we crossed the Navarro River near the entrance to Hendy Woods State Park. Wow, look at the water level in that river! California is in some real trouble! The ranger at the gate, a serious cyclist himself, admired our efforts. We told him where we'd come from and where we were going. "Oh," he warned us, "some of the locals on Orr Springs Road [the Monday road] are really crazy! Watch out for them!" This caused me to spend a substantial amount of the night fretting, picturing one of us fallen down and crushed under the wheels of some unruly pickup truck. The road turned out not to be bad at all in terms of traffic, and all my fretting was for nothing. We set up our camp among lovely California Coastal Redwoods. The camp had nice hot showers for a few quarters, although mine was a bit too hot, even for hot-tub-hardened me, and I couldn't figure out how to adjust it. I admired what we could see of the constellations through the mighty trees, and we settled into our sleeping bags around 9:30. Not having quite as much distance to cover on Sunday, and very few caches to find along the route, we figured we could sleep in until 7:00. Getting up at 7:00 allowed us to pack up camp and leave by 10:00. I had hoped to leave by 9:00 or 9:30, but that just didn't happen. We enjoyed breakfast in camp under the trees. We carefully debated taking some time to find a nearby cache and thus see a little more of the park. We made the decision, which we later regretted, not to take the time to ride an extra mile or so in each direction. I did hear a rumor that Hendy Woods is off of the not-yet-finalized park closure list, so we hope to go back sometime and see Big and Little Hendy Groves. We continued on Route 128 toward the Town of Navarro. We spent an inordinate amount of the morning photographing barnyard animals. They were so cute! Eric pointed out to me that if any of the locals saw us, they would take one look at us and say, "They city folk." 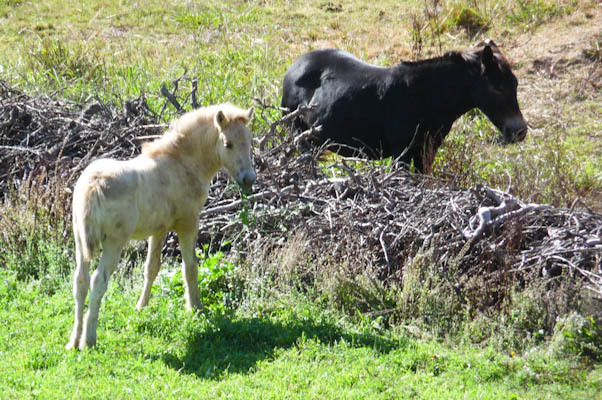 Look how this little white pony posed for me. 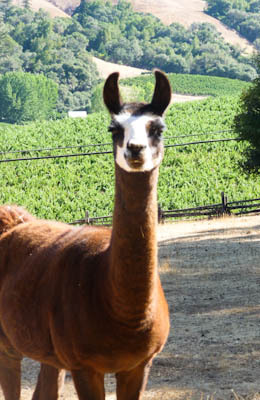 And look at the big eyelashes on this llama! 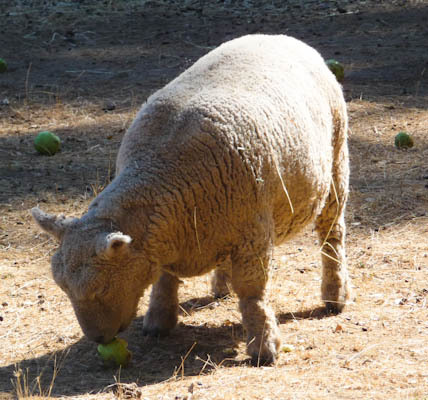 This white sheep was absorbed in his apple. 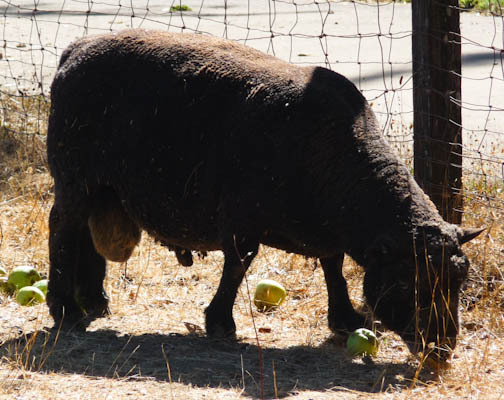 And I couldn't believe the package on this black sheep. 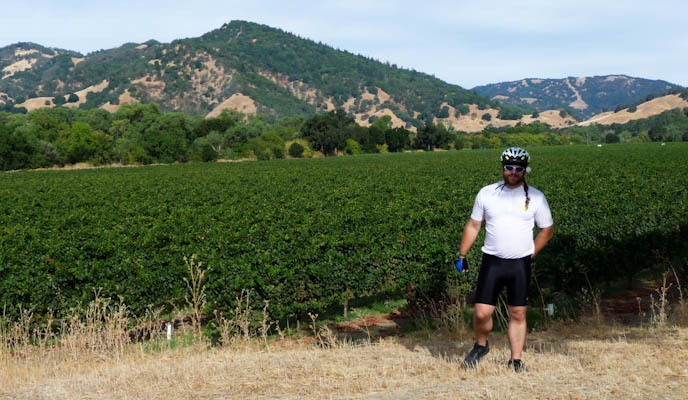 Eventually we tore ourselves away from the animals and rode off past some more wineries. The scenery was tremendous. 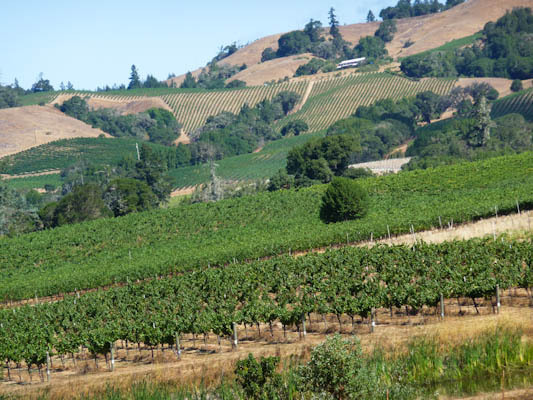 The road wound through steep hills all around us, with light and dark browns accented by golden sunny patches and row after row of dark green grape leaves. That tough topography certainly makes for some picturesque views. I remarked on the dearth of traffic in a place where we had expected many cars. Eric pointed out that it was 10:30 on a Sunday morning, and that everyone else was either sleeping or in church. "We're in the Church of the Road, baby!" I cried out, rolling down a hill. That we had made it so far seemed miraculous. Exposed as we were to the elements, We could see and feel the awesome power of nature all around us. We could feel the warmth of the sun and the coolness of the breeze all at once. We could smell the wondrous scent of the trees. It was an almost religious experience. At one point, we passed a winery that advertised food paired with wine. We considered stopping for some free food, but rejected the idea because we didn't want to disappoint our benefactors by buying absolutely nothing. We certainly didn't want to carry as much more weight as a bottle of wine (or even a jar of mustard) would have entailed! I said to Eric, "I'm sure they don't want to see the likes of us. I bet that to a sommelier, we look like a couple of vagabonds." He replied, "But to a Somali, we probably look pretty rich!" "Oh, yes," I said. "A Somali would probably say, 'Wow, you have a bicycle! You have a pretty nice bicycle! And it's even in pretty good shape! And, wow, look at that trailer thing! We could carry water for the whole village for a day in that thing!" We stopped for lunch at the Navarro General Store. We loved the Navarro General Store. 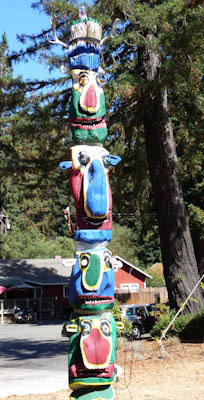 Travelers are greeted by a fabulous totem pole. 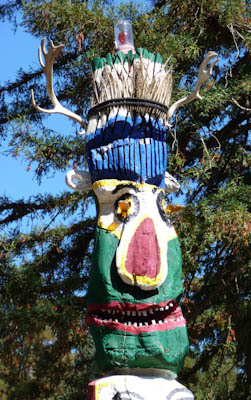 Really, this thing is so kitschy that it's got antlers, and eyes on the totems that light up. It must look spectacular at night! Not all of the art at the Navarro General Store was quite so kitschy. 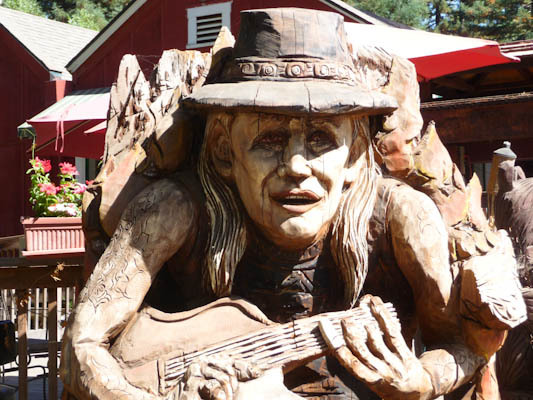 They had a number of wooden sculptures, including one of Johnny Winter (this place is so awesome, it has a stage for concerts). 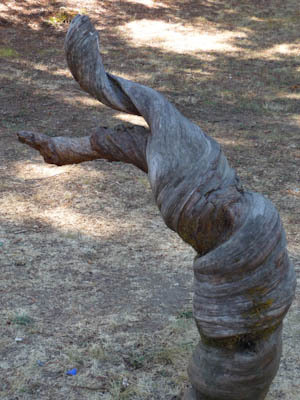 I was both impressed and disturbed by this particular wooden sculpture. It's very well done, but it makes me think of someone drowning headfirst in quicksand. I'm not whether or not that's intentional. We had sandwiches made to order by a counter girl with long jet-black hair and a pierced nose. We sat outside at a picnic table with the bikes. It was the counter girl who gave me the good news about Hendy Woods. We both had a nice time talking to her. What a contrast, what an incredible contrast, between the Navarro General Store and the store in the next town, Comptche! This was where we would face the first Really Big Crisis of the trip. We spent probably a little too long looking for a geocache that we didn't find in a Boy Scout camp along a lovely redwooded part of Route 128. We clearly should have spent that time looking for the cache in Hendy Woods. At last we gave up and headed on into Comptche, the last source of food before the end of the trip. We arrived, at the incredibly late hour of 2:20 pm, to find that the store had closed at 2:00! We had a store of Clif bars, some almonds, a bag of Snap Pea Crisps, and a little trail mix, but after 35 miles of cycling, we would want more than that for dinner! Horrified, I stood outside the door and looked in. I caught a glimpse of a young man sweeping up in the dark. I knocked on the door. He quickly disappeared behind the shelves. I could see a truck parked outside the store, and knew that someone working there had to leave in the truck. I was determined that they were not getting away without dealing with me directly. I stood outside the door for at least ten minutes. I noticed that the store was selling gasoline branded, "Arab Gold." Under normal circumstances, I would obviously transact no commerce whatsoever with such a business, but this was the only source of food for more than 11 miles, or at least an hour's ride each way. Finally I caught a glimpse of an older man, obviously the owner, inside the store. I knocked on the door and begged him to sell us some food. He reluctantly relented. We grabbed food as fast as we could, a couple of cans of chicken vegetable soup for dinner, along with some brown rice chips, some nuts for snacks, and some Oreos and Lorna Doones for treats. I paid the man, who turned out to be rather far on the path to drunkenness, and we hurried out of the store. We met a cyclist outside, one with an extremely expensive racing bike, who was very surprised the man had let us in -- apparently the store is notorious in the area for being very strict about the 2:00 Sunday closing time. This is information that really should have been in the guidebook! I said to Eric, "It's a sad, sad day when your only source of sustenance is a drunk guy who refers to gasoline as 'Arab Gold.'" However, I still felt that I had won the game, since we now had food. 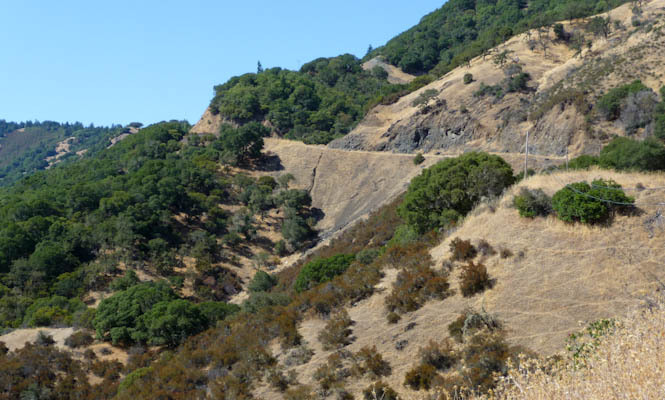 With Eric's trailer now further burdened with heavy canned food, we headed out along the Comptche-Ukiah Road. This was a long, steep climb up to 1200 feet, with a fast descent back down to 800. I hated giving up any of the elevation gain, because I knew we were going to have to pay it back on Monday. The road climbed again up toward the night's site, and Eric was obviously getting very tired. I had to offer many shouts of encouragement, as well as warnings to look up at the road. At least traffic was almost entirely nonexistent. Our frustration was increased by the fact that the site wasn't on any of my maps, and we were not entirely sure how much further we had to go. All the same, we decided we had enough light left to allow ourselves a few rest stops for geocaches, including another one we didn't find in Montgomery Woods. The counter girl at the wonderful Navarro General Store had told me this park was on the closure list, so I was glad to get an all-too-brief look at it. Eric was afraid we were going to have a day without a single find, but we at last found two caches in the woods along the road. Fortunately, our destination turned out to be closer than I had thought. We weren't quite sure we were there, but then Eric spotted a City CarShare car in the parking lot. We had targeted a 7:00 pm arrival time, figuring we would still be able to set up camp in daylight if we arrived by 7:30. We hit the gate right about 7:00. What a wonderful place! Orr Hot Springs is beautifully landscaped. 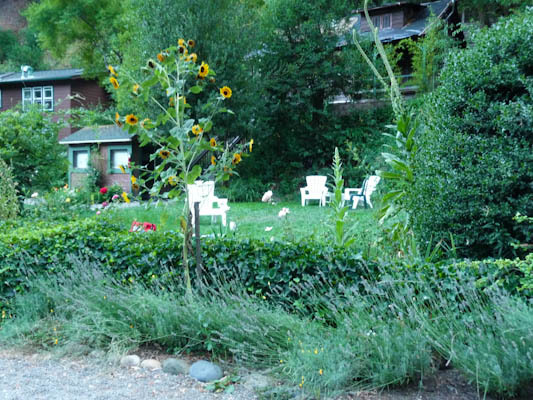 Orr Hot Springs was discovered by non-natives a few years after the Gold Rush. By the turn of the century, it had been developed into a stop for weary stagecoach travelers. Today, it still serves much the same purpose, although travelers arrive by different means of transportation. It was threatened by wildfires last year, and lost some of its buildings. But there are still accommodations aside from camping, although they are of course more expensive. We were greeted by friendly hippies and directed to our camping spot. We set everything up and then went to the communal dining area for dinner. It turned out that we needn't have worried quite so much about getting enough to eat. Several gourmet meals, full of freshly-harvested vegetables, were being prepared by more friendly hippies. Some of them offered us bowls of caramelized figs with ricotta cheese, covered with chocolate shavings and fresh honey. Wow! I opened the bag of brown rice chips and offered some of them, but Eric said, "No, do you guys want some Oreos? We want to offer you the best we have! It's just that the best we have isn't very good!" After our fabulous dessert, we enjoyed our relatively boring canned soup. We had a conversation with another cyclist, one who had done extensive cycle touring, about Monday's route. 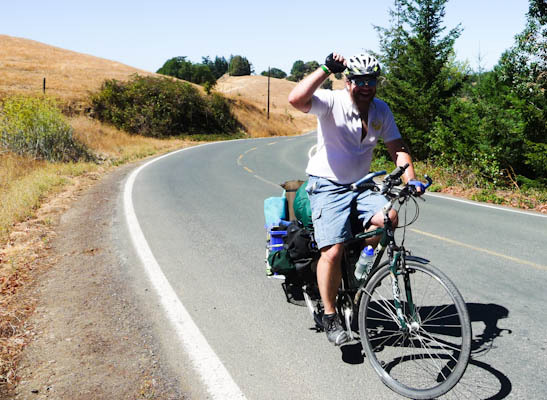 We were trying to make a decision whether to wimp out and leave our camping gear with the friendly hippies, ride back to Ukiah unencumbered, and come back to retrieve our gear with the relatively peppy Pearl. Eric's ankle was not too painful, but we were growing tired. We described where we'd come from and the roads we'd already climbed. The other cyclist said, "It's steep, but I think you can do it." I read the guidebook again. It said the climb had a false summit after three miles, and that the total climbing distance was 4.3 miles. Eric's GPS put us at about 900 feet, and the maps told us the summit on the road was at about 2500 feet. I ran the numbers with a calculator, and came up with a grade percentage of 7. "Seven percent's not so bad," I declared. "I think we can do it." We then spent a lovely evening soaking in some nice hot water. They even had private tubs. They also had a small lithium pool, where you could absorb the happy element transdermally, but it was a little too cold for me at 98 degrees. We went to bed feeling happy and refreshed. Since we had only 15 miles to cover on Monday, we let ourselves sleep in until 8:00. We heated up water in the communal kitchen and enjoyed tea, oatmeal and pop-tarts that we had brought with us from home. While dinnertime had been fairly lively, breakfast was relatively quiet. Someone cleaned up a spot of cat barf on the dining room floor. We showered, struck camp and packed up the bikes. Someone had left leftover salad with chicken and cheese in the kitchen, so we helped ourselves to a couple of bowls and sat for awhile in a lovely outdoor picnic area. It would have been entirely idyllic if We were not bothered by wasps who were much more aggressive than the ones I am trying to eliminate from our yard -- they were relatively unresponsive to frantic waving of one's arms. We contemplated hanging around and enjoying the place for another hour or so, but decided to press on since we were feeling fairly unsure about the Big Hill. The guidebook promised that the Big Hill would start immediately after the camp spot, and it sure did. In less than a tenth of a mile, we had climbed more than 100 feet. The curves to the right on the steeply cambered road, in particular, were devastating. It was difficult for me to get through them even standing up. In that first tiny bit of the Big Hill, we saw a cyclist speeding the other way on a peppy road bike. We waved to each other. After another tenth of a mile or so, and another 100 feet of elevation gain, we stopped to admire the view and take some pictures. The other cyclist, having obviously turned around and started back up, caught up with us and offered to take a picture of the two of us. She absolutely couldn't believe that anyone would think of making it up such a Big Hill with so much gear, much less that anyone would actually go out and do it. She moved on, telling us that her sweetie was waiting for her further up the Big Hill. A few minutes later, we saw the two of them waving down at us from the next rise. We pushed ourselves on up to meet them. 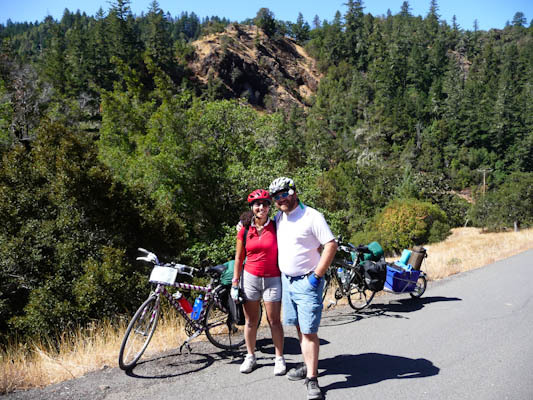 The man of the couple turned out to be Dave from Dave's Bike Shop in Ukiah, and the woman was his girlfriend, Ginny. We were incredibly fortunate to run into them. They were serious local riders, and knew every inch of the road. They would tell us how steep the next section was going to be, and how far it was to the next less steep section. They taught us, in the virtually nonexistent traffic, to ride around curves to the right on the outside of the curve, which was considerably easier. They taught us to ride around the sections of loose gravel in the road in the better-groomed oncoming lane. Ginny warned us that our brakes would heat up on the way down, and told us to take a break to cool them off. Ginny also told us that my calculations as to the grade had been incorrect. The last 1.3 miles, after what the guidebook described as a false summit, were quite a bit less steep. Thus, the grade for the first three miles was 10%! What!?! If we had known we were going to climb three miles of a 10% grade, I don't think we would have attempted the trip even without the gear! But it's a good thing we didn't know, because with the company of Ginny and Dave, the climb was pleasurable rather than painful. I'm grateful that training gave me the aerobic strength to carry on a conversation while seriously straining myself. They were wonderful. We stopped frequently to take pictures of the dramatic road behind us. Ginny rode on ahead to take pictures of us riding together. and right after surmounting the summit! There was very little relief from pain for Eric, however. 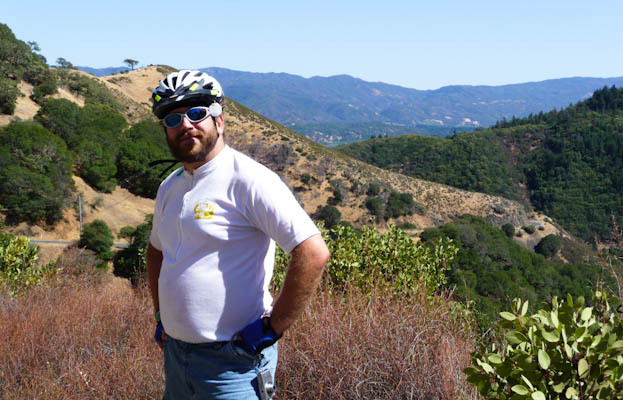 Only a few moments after cresting the Big Hill, he was stung on the thigh by one of those highly aggressive Mendocino County wasps. We stopped, and I looked at the wound. I didn't see a stinger, so just gave Eric an alcohol wipe. We expected Dave and Ginny to have taken off after we'd been stopped so long, but we soon found them waiting for us. Dave had been stung by a wasp right after the crest of the Big Hill as well. Ginny said, "That's usually where I get stung," implying that this is a common occurrence. Well, the guidebook sure didn't warn us about that particular hazard! We set off again, and, on a speedy descent at probably about 20 miles per hour, I suddenly felt a sharp pain on the top of my right cheek. I tried to rub it, and felt another highly aggressive wasp clinging to my face! I tried to rub the vicious creature off, but it was already gone, leaving behind a nasty stinger sticking out of my cheek. I started screaming for all my lungs' worth for Eric to stop and help me. He later said that, hearing my screams, he expected to see me flat in the middle of the road and not upright on the bike. And yet I was managing to keep up with him. We stopped, and pulled the bikes out of the shoulderless roadbed as best we could. He removed the miserable stinger with a pair of tweezers, and I rubbed my injured face with another alcohol wipe. With both of us stinging from insect bites, we continued down the Big Hill. My face didn't swell much, but you can see how close to the eye the wretched thing got. Good thing I was wearing glasses! Dave had taken off to race a car down the Big Hill, but we found Ginny waiting for us not too much further down. She was the only one of us who managed to avoid an awful sting. This was all for the best, as she was the only one of us who was allergic to the venom. While I was showing her my face, a kind motorist in a white pickup truck stopped to check on us. She offered us a tee tree oil ointment for our wounds, which cooled them off a bit. Now, really, if the guidebook had mentioned that this would be a 10% grade for three miles, followed by a stretch wherein you had a 75% chance of receiving an evil wasp sting, do you think we would have attempted this ride? Almost certainly not. But then we wouldn't have earned the right to say we did it, and we wouldn't have met Ginny and Dave. We told Ginny that she really shouldn't wait around for us any further, because we were going to look for a geocache. She gave us their address and invited us to stop by their house when we got to the bottom of the Big Hill. We did find a cache on the hill, and we took some pictures of the east side. We found a few more caches on the way to Dave and Ginny's house, but caught up with them at last. We sat on the patio in their lovely yard and played with their adorable dogs. Ginny served us a quinoa salad with cranberries and fresh tomatoes with mozzarella cheese. It was a wonderful ending to an arduous but superb trip. We were so grateful that we left at just the right time to run into them. 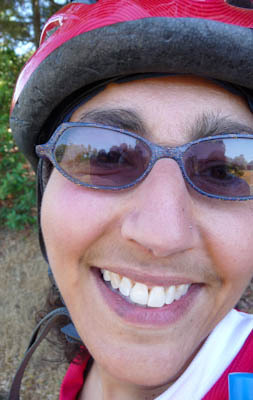 We rode around Ukiah a bit after our snack, looking for other caches, because my cyclometer was tantalizingly close to rolling over 3,000 km. I made my milestone, earning me a total of about 2,200 km in a year. After half an hour of repacking Pearl with our voluminous gear, we had a refreshing dinner at a nice Thai restaurant recommended by Ginny before heading back down Route 101 to the Bay Area. We feel incredibly fulfilled. We pushed our bodies, including Eric's injured one, much further than we thought they could go. And we still managed to make it! 114 miles in three days is not a remarkable distance for cyclists who do significant touring, but considering our load, our hybrid bikes, and our beautiful but arduous terrain, it was quite an achievement. We kept saying to ourselves, "We did it!" In spite of our insect bites, we feel fabulous. We prepared for the expected hardships to the best of our ability, and still faced unexpected difficulties. But we overcame each and every one. We emerged triumphant in the face of adversity. And we enjoyed some incredible scenery in a very intimate way. Most of all, we did it together. Both the training and the trip were good times spent together. They represented bonding experiences in sharing trials by fire, and bonding experiences in sharing spectacular scenery. Twenty years into our relationship, we are very happy to have each other as partners.